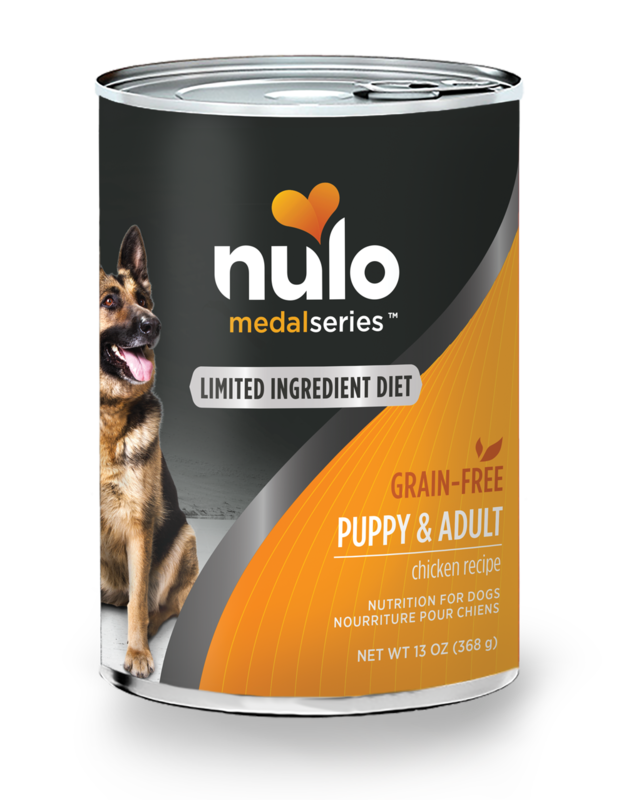 Dogs & puppies with sensitivities can enjoy Nulo’s tasty canned recipes, too! Featuring a single-source animal protein, our MedalSeries Limited Ingredient Diet Chicken Recipe is sure to satisfy spunky dogs and pups alike, while offering a more simplified diet. Formulated with 95% Chicken & Chicken Liver, you won’t have to sacrifice high quality in exchange for a simplified diet. Use as the primary diet for your dog/puppy or as a tasty topper for our Limited Ingredient dry kibble recipes. Chicken, Chicken Broth, Chicken Liver, Lentils, Ground Flaxseed, Natural Flavor, Potassium Chloride, Inulin, Agar-Agar, Sodium Phosphate, Choline Chloride, Menhaden Fish Oil (Preserved With Mixed Tocopherols), Zinc Proteinate, Iron Proteinate, Vitamin E Supplement, Copper Proteinate, Manganese Proteinate, Sodium Selenite, Thiamine Mononitrate, Cobalt Proteinate, Niacin Supplement, d-Calcium Pantothenate, Vitamin A Supplement, Riboflavin Supplement, Biotin, Vitamin B12 Supplement, Potassium Iodide, Pyridoxine Hydrochloride, Vitamin D3 Supplement, Folic Acid. MedalSeries Canned Limited Ingredient Diet Puppy & Adult Chicken Recipe is formulated to meet the nutritional levels established by the AAFCO Dog Food Nutrient Profiles for all life stages including growth of large size dogs (70 lb. or more as an adult).